Create compelling digital media which will get you noticed in a fast-moving industry. In our impressive studios you’ll develop professional skills in both media production and content creation. In this practical course, you’ll produce a substantial portfolio of high quality media production work to impress potential employers. From exciting competitions to collaborative projects with industry, you’ll be challenged to come up with innovative solutions in a range of inter-related media. Our students work regularly with organisations such as Derby County FC, the Derby Telegraph and Film City Derby Jazz & the BBC. 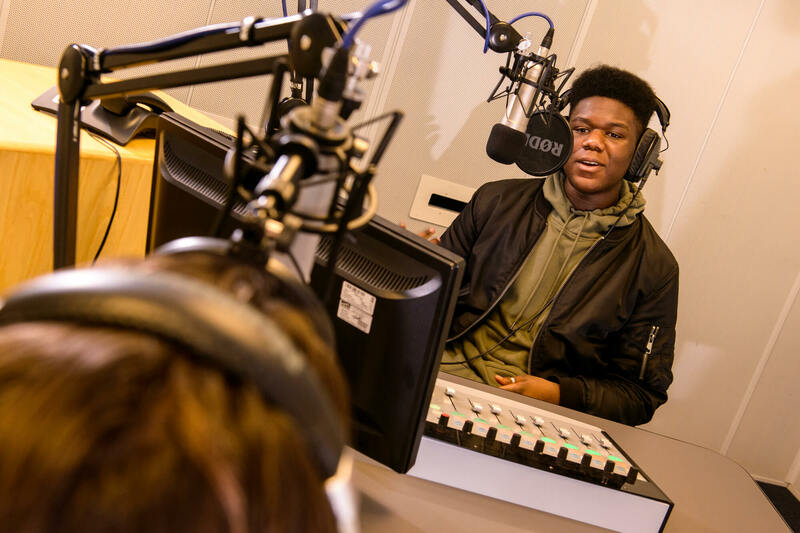 You’ll hone your skills in our professional TV & Radio media studios, supported by an enthusiastic teaching team with extensive experience in the broadcast and new media industries. If you want to create compelling Digital Media be that TV, radio, print or online products, the possibilities are endless on our BA (Hons) Media Production. We’ll help you develop original, challenging and inspired work which will get you noticed in a fast-moving world where new media platforms are constantly evolving. This innovative programme has been designed to support you in developing professional skills in both media production and content creation. The course will prepare you to take on a wide range of different roles within an ever changing media landscape and media industry, dealing with the development of digital content for both traditional and convergent media platforms. You will graduate from this course as a professional who not only understands the production processes, but who is also proficient in content creation and production. Graduates will be equipped to work with media and communications in a wide range of industries. As a media graduate you will be ideally suited to work independently to create media artifacts in many small, medium and large organisations. However, the eclectic range of skills you will develop on this degree also puts you in a unique position to manage many other enterprise projects where your specialist area is combined with a wide range of other disciplines. Very few graduates will have both the breadth and depth of focus that you will develop on this course! Film festival screenings and even a move to LA could be on the cards for our award-winning Film and Media Production students. In year one you will study a range of modules designed to help you develop an understanding of the media industries, their products and the ways in which those products can be understood. You will study writing for the screen in Writing for Media Production 1 where you will explore the conventions and practices of writing for different media formats. You will also undertake practice based modules in Television Production 1, Radio Production 1 and Digital Publishing 1 that will develop and build a core set of skills, practices and theoretical approaches that will be the foundation for the rest your programme of study. Year two will allow you to explore and interrogate key theories and practices that aid recognition of the synergies, cross-fertilisation and convergence that exists in contemporary media industries and the way that many media producers work across a variety of media platforms. It is with this in mind that in year two you will continue with the strands of television, radio and digital publishing. This module enables you to relate your academic knowledge to the work environment. It also provides a framework for you to develop skills relevant to all areas of professional practice, including objective setting, planning, negotiating, implementing, demonstrating and reflecting. You’ll gain insights into the commercial realities and external factors that influence the success of an organisation. In Year three you shall continue to further develop your professional practice, skills and critical theoretical underpinning within an independent research and production ethos, through means of an Independent Production Portfolio in which you will be able to develop, research and create for an extended negotiated research production project of your own design. You will also be able to refocus your production specialisms by choosing two out of the three production pathways that you have studied during the previous two years. This narrowing of focus is designed to facilitate your engagement in a deeper, more detailed and intensive production of work. This sees the culmination of the traditional broadcast pathways in terms of Radio Production 3 and Television Production 3 in the creation, production, development and delivery of more substantial and deeper broadcast media artifacts. Whilst the Digital Publishing 3 option will enable you to interrogate the impact of digital devices and technologies that can be employed to support, or even extend, the users experience of traditional broadcast media artifacts. With specific focus on media convergence you will be able address and create transmedia artifacts, immersive second screen products, speculative methods of content access and consumption that will align and compliment current and future forms of traditional broadcast media production. There are a variety of assessments which play to a number of strengths. You will get the opportunity to succeed in digital publishing, radio and television production work, written work, oral presentations, group work, work based learning and independent study. Whilst some assessments are designed to demonstrate cumulative understandings and key skills, for example critical essays, presentations or production work, others require reflection on the creative production or learning process such as the completion of digital journals, research reports and formal cogent presentations. Feedback is always constructive and encouraging whilst adhering to rigorous assessment criteria. Requirements for assessments progress each year, and assessments are designed to facilitate the meeting of the learning outcomes. The BA (Hons) Media Production course incorporates lectures, research exercises, screenings, self-directed study, seminars, studio work, tutorials, work experience opportunities and visits to venues such as BBC Broadcasting studios. There is the chance to specialise in the aspects of media production which most interest you, while developing broader transferable skills in areas such as research and management. Our focus is on providing you with exciting hands-on experience of designing and creating media texts. This includes professional live briefs set by a variety of organisations to give you a real insight into the rewards and pressures of media industry careers. Our students, for instance, produce digital content for both Derby County FC and the Derby Telegraph on a regular basis. One team of students produced such impressive work while capturing the Royal Shrovetide Football game in Ashbourne that it featured on BBC East Midlands Today. Other intriguing projects have seen our students shooting music videos and conducting interviews with artists for the launch of digital channel Shaanti’s Eastern Electronic Music TV Show which they were nominated for in the Best Entertainment Catagorie at the Midland Royal Television Society Awards and helping The Boparan Charitable Trust to develop a new website and social media content to support its work for children in need. Competition work is also an integral part of the course as one recent success story saw two Media Production students shortlisted for the Midlands Media Awards 2015. Assessment is based entirely on your coursework: there are no examinations. This Media Production course is taught by active researchers and practitioners who will inspire, challenge and help you get the most out of your studies. Practical elements are delivered and supported by tutors with first-hand experience of working in the media industries while theoretical modules are taught by research-active staff who publish on a regular basis. You’ll be equipped for a career in the broad world of media production, with the key practical skills and knowledge you need to work as a self-starter or as part of a production team. There are wide-ranging opportunities to specialise in areas such as TV, radio, and online media. Our graduates now work in fields such as TV studio production, public relations and online content production across radio and web. University of Derby third year Media Production student, Yue Liu's Drama Documentary depicts the story of rural China and how new technology is aiding communication between absent parents and their children in the school environment. Here at Derby, we provide excellent learning resources, libraries and specialist laboratories and studios. There will be occasions when you will be expected to attend exhibitions, screenings, performances and festivals. You will need to budget for these over each academic year.